Hello! It's been awhile since I made anything with any of my adorable Cocoa images from Sweet 'n Sassy Stamps. Found this one when I was going thru my box of already colored/cut stuff and thought it would go perfectly with this new embossing folder I picked up at stamp show last weekend. It's from a UK company (can't remember the name) but the folder is called "football"! ;-) I used my Sweet 'n Sassy grass die with it for a Quick and Easy card. I made/printed the sentiment with my computer and cut it out with a PTI cloud die. Softly went around the edges with some Distress Ink. Make's for a fun kids card. Thanks for stopping by and be sure to stop back by tomorrow for the new sketch from Tuesday Morning Sketches. Challenges are listed below. SCS Falliday Fest ~ Put me in Coach! It’s lovely to see you have joined in the ‘Cute’ challenge at Crafty Friends Challenge Blog. 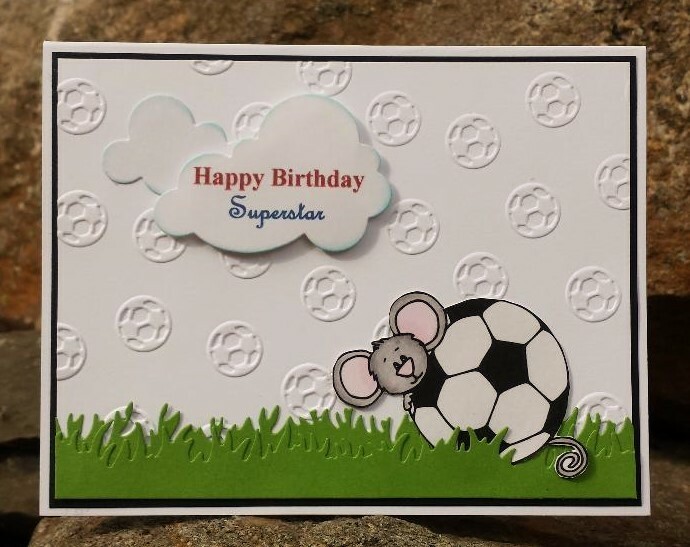 Beautiful card design using a super cute footballing mouse image and great use of dies too... Good luck in the draw and we hope you will come back again very soon. This is so cute. Love your card. Thanks for sharing with us at Seize the Birthday. Absolutely adorable card! Your image is colored so nicely and the added embossed panel just goes perfectly with your image! You picked up some really awesome things at the stamp show!